These outdoor kitchen tips can save you from making mistakes planning your outdoor living area. Families everywhere are discovering the joy of creating a private retreat in their own backyard. The allure of a fabulous backyard featuring a gourmet outdoor kitchen evokes visions of hosting exciting and memorable parties with family and friends or just enjoying a relaxing weekend in your own resort-like setting. But be careful when planning your outdoor area, especially with an expensive outdoor kitchen. Backyard projects can costs thousands of dollars. These tips can help you save money and avoid mistakes when planning your outdoor living area. If you are planning a built-in grill into your outdoor kitchen, make sure you are getting a grill that will last. Since a quality grill is a high ticket item, it is very tempting to conserve your budget by selecting a bargain grill. Getting a less expensive grill is not a bad idea, but opt for a cart model if you are planning to trim your grill budget. If your cart model grill fails, it is easy to find a replacement. With a built-in grill, you might not be able to get replacement parts if the company changes models, discontinues your grill, alters the chassis, or maybe even goes out of business! 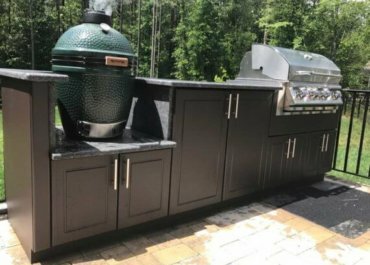 If you have built the grill into a custom outdoor kitchen flanked with granite or stone, it will be very expensive to modify your cabinet and countertop if your grill needs replacement. Beware, many of the pretty grills you see in big box retailers simply will not last more than a few years. These grills are usually priced accordingly, so there is nothing wrong with buying one, just do not build it into a structure. Researching a good grill is not difficult. Look for reviews on the internet, ask several different outdoor kitchen companies for recommendations, or better yet ask family and friends for their experience with different brands of grills. You will soon discover that some brands you have never heard of often make the best built in grills, while some very poor quality grills carry familiar name brands. Here is an insider tip. Most outdoor kitchen companies make a majority of their money on grills and other appliances. While there is nothing wrong with a company earning a profit for their product, the natural byproduct of this fact is that outdoor living areas often feature outdoor kitchens that wind up looking like a shrine to a grill. It is true that food is often the center of a backyard party, the actual cooking appliance should not be the center of attention. It is hard to resist the urge to showcase your expensive grill, but ask yourself how many times guests form a semi circle around your oven or stove inside your house. Friends congregate around comfortable seating, around the television, or around where the food and drink are served, not usually where the food is being cooked. If you look at pictures of many barbecue grill islands, you will often see bar seating directly behind the grill. That is the worst seat in the house. Most grills are designed to vent heat and smoke out the back of the grill, exactly where some designers like to build a bar! Consider building your grilling area away from the main “hang out” area. Also, you may not even like grilling. There is no rule that your outdoor living space even has to include a grill! If it is hot, your guests simply will not want to stay where there is no shade. This does not mean you have to kill your budget with an expensive gazebo. You can get a lot of shade from inexpensive patio umbrellas available at home improvement centers. Plus, umbrellas can usually be repositioned if the sun moves. Plan your seating around existing trees, or plant new trees to cover seating areas that get afternoon sun. Incorporating lighting, water features, fire pits, and music will make your outdoor living area more inviting, particularly for evening events. If you host a party at night, nobody will want to sit around in the quiet dark of night. Guests will feel more comfortable enjoying the sight of lights, the sound of water moving with great music playing in the background. Some creativity in your planning will go a long way without costing you much money. Tiki torches are available for less than $15. Inexpensive portable speakers plugged into your mp3 player can bring the music outdoors. Do it yourself landscape lighting packages easily accent your landscaping and create pleasant ambient light. Even the dancing flames of strategically placed candles can help create the perfect atmosphere without breaking the bank. Whatever you select, do not expect your guests to enjoy a featureless area listening to the crickets chirping. If you watch many of the popular home makeover shows, you have probably seen the team of designers swoop in and transform an ordinary backyard into something suited for the cover of a magazine. Do not get fooled by the wow factor alone. A brand new outdoor living area that looks great for the photo shoot may not hold up to the outdoor elements. On these makeover shows, you will often see an array of draperies, throw-pillows, rugs, furniture, and other decorations that simply are not built for outdoor use. No matter where you live, anything you put outdoors will get dirty and wet. Ask yourself how easily it will be to clean everything you put outside. Or how easy will it be to lug everything in and out of your house every time you want to enjoy your backyard. An easy solution to keeping your outdoor area looking pristine is to plan appropriate storage for your seat cushions and decorations. It will only take you a few minutes to place cushions and other decorations in time for your guests if they are stored nearby. Anything you introduce into your outdoor area that is fabric or has been painted or stained will require regular maintenance. Teak, cypress, and redwood look beautiful, but will require regular maintenance. Do not underestimate the amount of work it takes to clean, sand, and re-stain or paint wood. This can be a big project. Stainless steel is not invincible. It stains LESS than ordinary steel, but can still show its age. A variety of stainless steel cleaners are available, but do not skip the maintenance just because it is ‘stainless’. After all, why do you think retailers have an entire aisle devoted to stainless steel cleaners? Consult a landscape professional with knowledge of your local climate to select low maintenance plants. You want to spend your time enjoying your backyard, not working in it! Most companies that advertise themselves as turnkey outdoor living experts do not actually do all the work themselves. It is common for one company to subcontract work to an entirely different company. For instance, if you are hiring a landscape company that also builds outdoor kitchens, you can bet that they do not have granite countertop cutting equipment or staff in house. That portion of the project would surely be subcontracted to a third party provider. You can certainly get quality work this way, but it is typical for companies to mark subcontracted portions of the project up between 10 and 30 percent. There is no “right way” to do an outdoor kitchen. Your living space should reflect your tastes and lifestyle. Be a savvy shopper and spend time researching products on the internet. Your careful planning will not only save you money, but more importantly help you create the outdoor living space of your dreams.